Being Engaged to Kit Harington Sounds ExhaustingRose Leslie discusses the quirks of their relationship. Gunpowder Is Not at All ExplosiveDespite the presence of Kit Harington, this HBO mini-series about the Gunpowder Plot is dull. Kit Harington and Ed Sheeran’s Friendship Meet-Cute Happened at a UrinalHarington told Nicole Kidman and James Corden the nutty beginning of his friendship with Ed Sheeran. Kit Harington Is the Reason Jon Snow Has a ‘Tiny Pecker’ on Game of ThronesEveryone loves to make fun of Kit Harington on set. Kit Harington and Liv Tyler Will Star in Guy Fawkes–Inspired Drama GunpowderArwen and Jon Snow get their hands on explosives. Kit Harington Packed a Picnic for YouJust go ahead and help yourself to some of that bread. Even Jon Snow Starts a Brawl at McDonald’s SometimesKit Harington’s black eye might have helped him land the part. Kit Harington to Play Call of Duty VillainHarington will play the face of the enemy faction. RIP Jon Snow’s BeardThankfully, his hair is still intact. 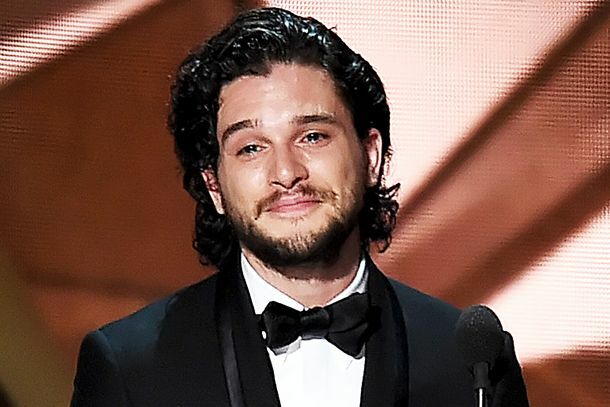 Kit Harington Wants You to Know That Men Face Sexism TooJon Snow wants you to know he’s more than a good head of hair. Kit Harington Takes a Lie-Detector TestDo you really know nothing, Jon Snow? Jon Snow’s Hottest Moments on Game of ThronesHis pouts, his hairdos — a retrospective of smoldering. Movie Review: Testament of YouthStarring Ex Machina’s Alicia Vikander and Jon Snow himself, Kit Harington. Being a Hunky Man Is a Demeaning Job It’s hard out here for a hunk. Kit Harington Puts His Bitchy Resting Face to Good Use in Jimmy Choo AdsTurn that frown into dollars. Here’s Jon Snow’s Best Blue SteelKit Harington is in a new Jimmy Choo ad.